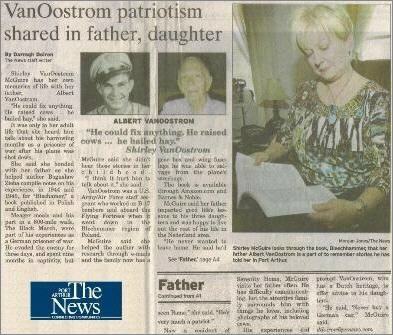 Shirley VanOostrom McGuire has her own memories of life with her father, Albert VanOostrom. „He could fix anything. He raised cows … he bailed hay“, she said. It was only in her adult life that she heard him talk about his harrowing months as a prisoner of war after his plane was shot down. She said she bonded with her father as she helped author Boguslaw Zieba compile notes on his experience, in 1944 and 1945, for „Blechamer“, a book published in Polish and English. Meager meals and his part in a 600-mile walk, The Black March, were part of his experiences as a German prisoner of war. He evaded the enemy for three days, and spent nine months in captivity, but McGuire said she didn’t hear those stories in her childhood. „I think it hurt him to talk about it,“ she said. VanOostrom was a U.S. Army/Air Force staff sergeant who worked on B-17 bombers and aboard the Flying Fortress when it went down in the Blechemmer region of Poland. McGuire said she helped the author with research through e-mails and the family now has a gear box and wing fuselage he was able to salvage from the plane’s wreckage. The book is available through Amazon.com and Barnes & Noble. McGuire said her father imparted good life’s lessons to his three daughters and was happy to live out the rest of his life in the Nederland area. Now a resident of Serenity Home, McGuire visits her father often. He has difficulty communicating, but the attentive family surrounds him with things he loves, including photographs of his beloved cows. His experiences did prompt VanOostrom, who has a Dutch heritage, to offer advice to his daughters. „He said, ‘Never buy a German car,’“ McGuire said.